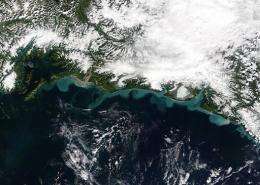 This NASA Terra satellite image shows Alaska's southern coast in 2003. The world's smallest known whale population has dwindled to about 30 individuals, only eight of them females, according to a study released Tuesday. The Bering Sea and Gulf of Alaska once teemed with tens of thousands of North Pacific right whales. The world's smallest known whale population has dwindled to about 30 individuals, only eight of them females, according to a study released Tuesday. The Bering Sea and Gulf of Alaska once teemed with tens of thousands of North Pacific right whales. But hunting in the 19th century wiped out most of them, with up to 30,000 slaughtered in the 1840s alone, according to the International Union for the Conservation of Nature (IUCN). Poaching by the Soviet Union during the 1960s claimed several hundred more, making Eubalaena japonica probably the most endangered species of whale on Earth. "Its precarious status today ... is a direct consequence of uncontrolled and illegal whaling, and highlights the past failure of international management to prevent such abuse," said the study, published in the British Royal Society's Biology Letters. Numbering well under 50, the eastern North Pacific right whale -- which can reach up to 18 metres (60 feet) in length -- falls below the IUCN's threshold of likely viability as a species. The small number of females is especially worrisome, said the study, led by Paul Wade of the Alaska Fisheries Science Center. A genetically distinct population of right whales in the western Northern Pacific is in slightly better shape with several hundred individuals, but is nonetheless listed as "critically endangered" on the IUCN's Red List, the most scientifically respected index of threat level. Right whales across the northern Pacific are also especially vulnerable to ship collisions because the animals cross a major trans-Pacific shipping lane as they move to and from feeding and breeding grounds. "The probability of ship-strike mortalities may increase with the likely future opening of an ice-free Northwest Passage," the researchers note. To carry out their grim census, Wade and colleagues used two standard method for measuring whale populations. One was based on photos taken during visual sightings, from airplanes during the period 1998 to 2001 and again in 2008, and from ships in 2005 and 2007. The other involved collecting biopsy tissue samples to gather genetic material, with a total of 43 taken over a 10-year period. The two independent methods yielded nearly identical results -- 31 individuals through photography, 28 through genotyping -- thus lending more weight to the results.